We first met South African Chef Bertus Basson at a Big Green Egg hands-on demo held at Overture in Stellenbosch. 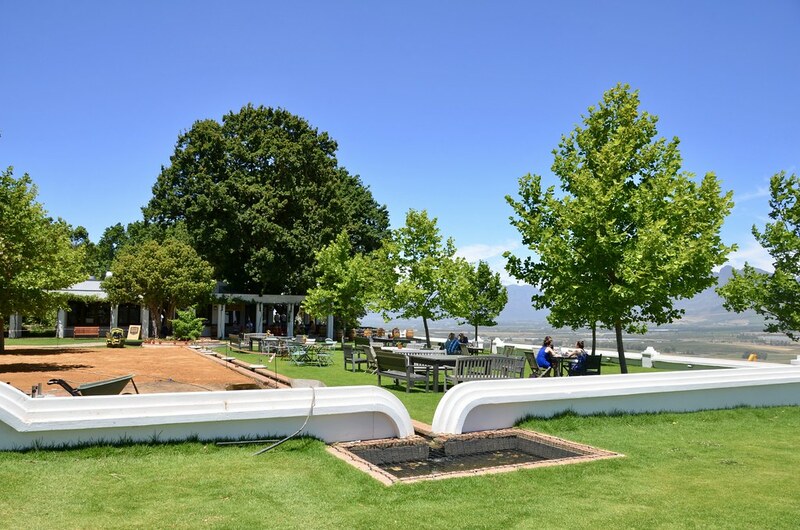 Overture, which Bertus Basson established as chef and owner in 2007, is one of South Africa’s Top 10 Restaurants and has been for 9 years in a row. 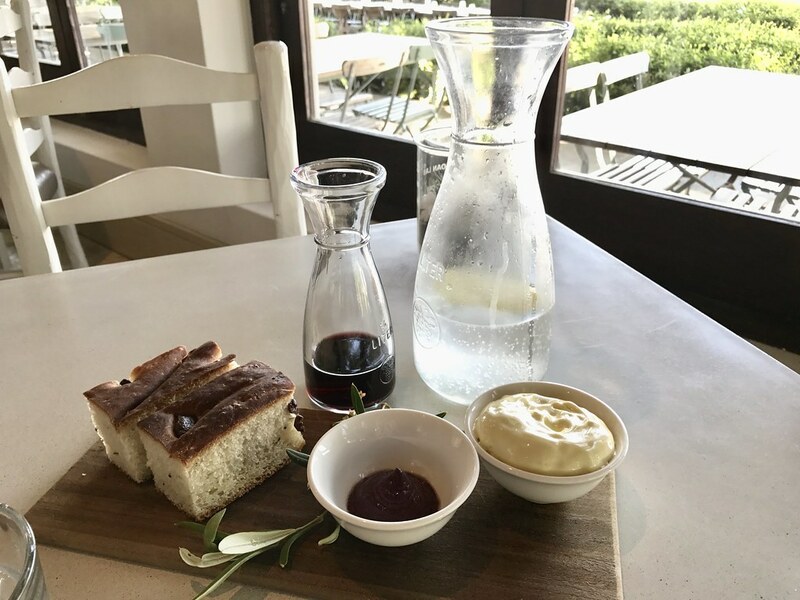 So, when I read that The Chef added a new restaurant to his food empire, I knew we needed to eat there when we returned to the Cape Winelands in August 2016. What I love most about Chef Bertus Basson is his unpretentious style and love of fresh ingredients. 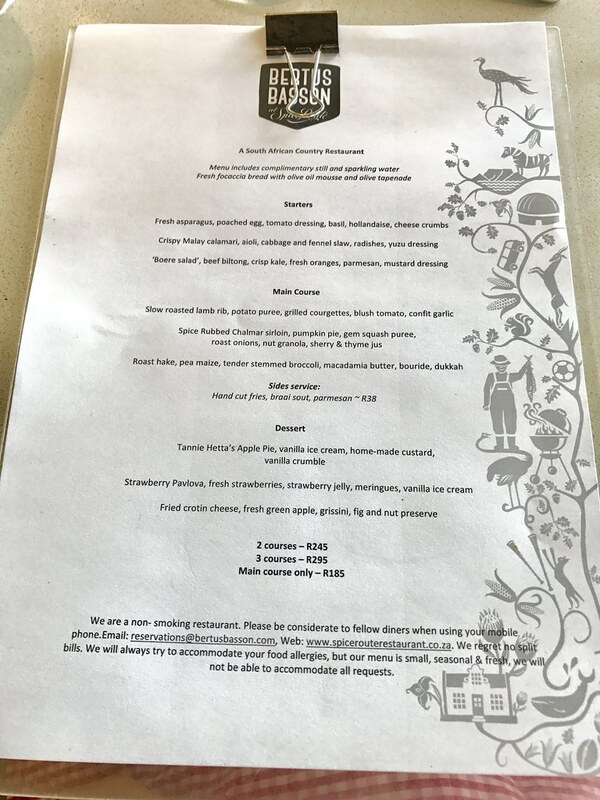 The menu combines up-to-date techniques and ideas with traditional South African favorites. Our 3 course lunch included fresh focaccia bread, olive oil mousse, and olive tapenade. John and I both started with the crispy Malay Calamari served with a cabbage and fennel slaw, aioli, radishes, and yuzu dressing. Yuzu is a Japanese citrus fruit that can be a little sour. 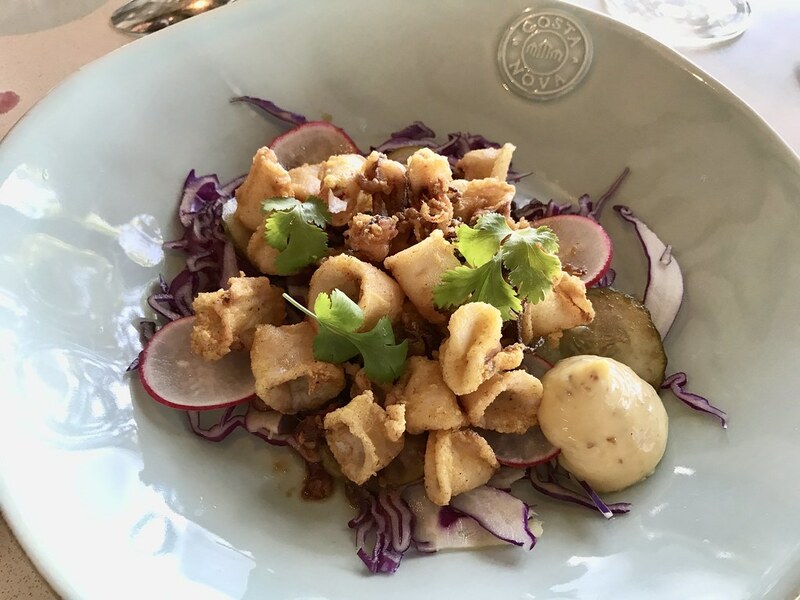 The tanginess of the dressing perfectly complimented the sweet and nutty calamari. For the main course John chose the spice-rubbed Chalmar Sirloin served with a take on pumpkin pie, gem squash puree, roasted onions, nut granola, and a sherry thyme jus. 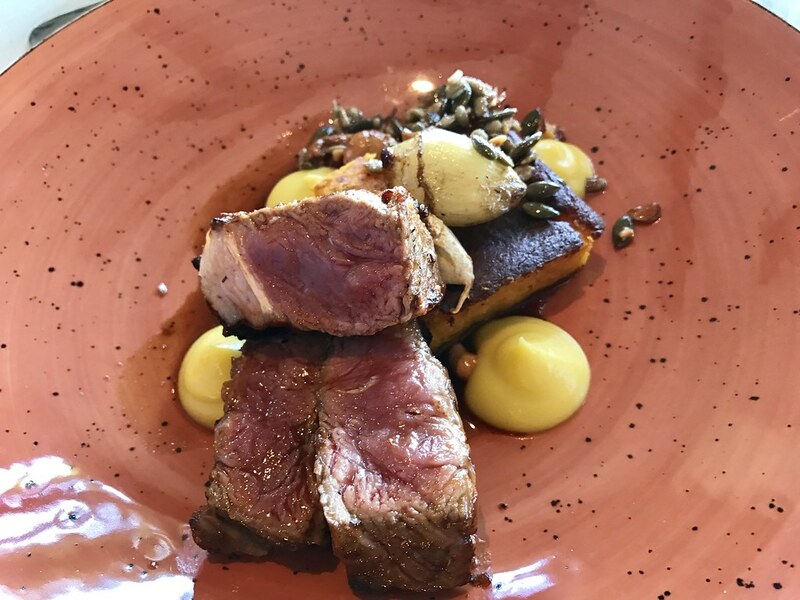 Chalmar Beef has grown to become one of the most trusted and sought-after beef for restaurateurs, premium butchers, and chefs throughout South Africa. It has an intense beefy flavor and an unbeatable texture thanks to its firm and tender muscle. 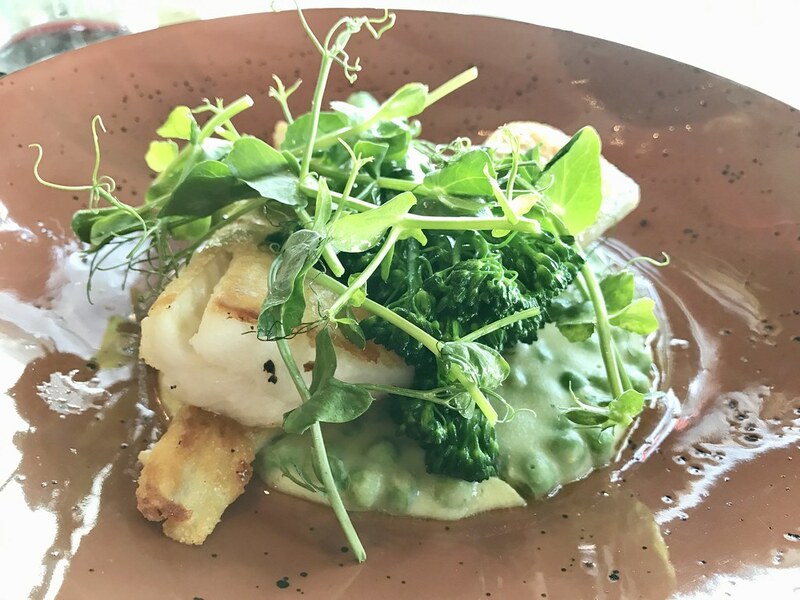 I chose the Roast Hake served with pea maize, broccoli, macadamia butter, bourride (fish stew with aioli), and dukkah. Dukkah is an Egyptian spice blend consisting of herbs and nuts. It may seem like there is a lot going on for a fish dish, but the flavor balance was on point and the hake handled it all quite well. 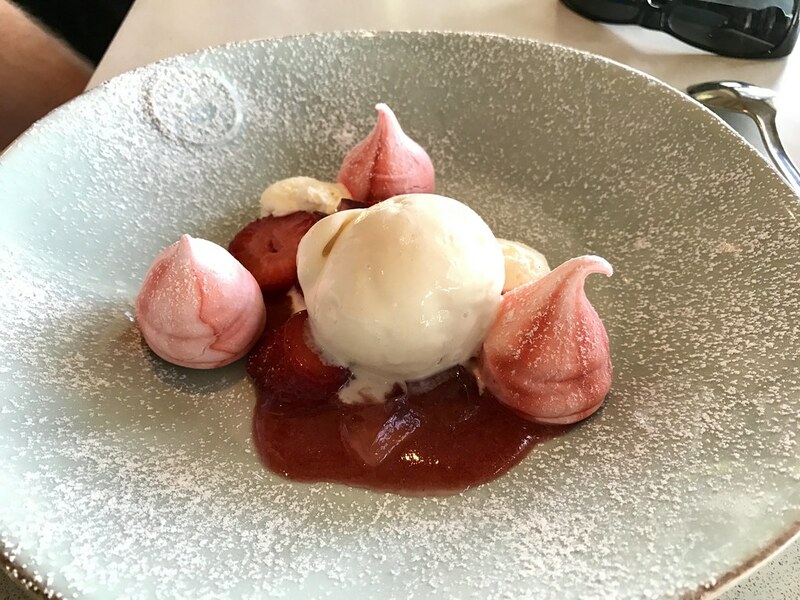 For dessert, John went with the Strawberry Pavlova served with fresh strawberries, strawberry jelly, meringues, and vanilla ice cream. Pavlova is a meringue-based dessert named after the Russian ballerina Anna Pavlova. The light and clean flavors were the perfect ending to his rich and bold main course of Chalmar Sirloin. I will most likely always choose cheese for dessert so I was excited to see Fried Crottin on the menu. Crottin de Chavignol is a famous goat cheese produced in the Loire Valley. 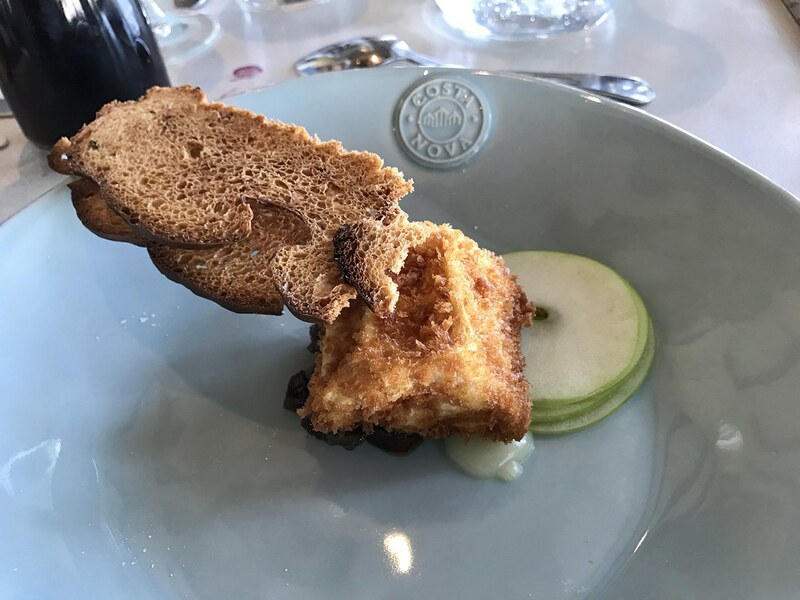 The nutty cheese was perfectly paired with tart green apples, sweet fig and nut preserves, and crisp breadsticks (grissini). Yeah, I was clearly in Paradise with that one. 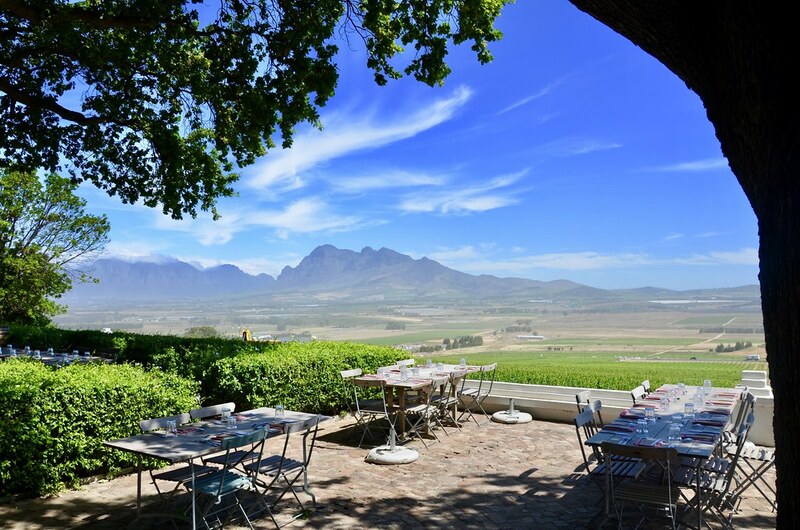 I mean, how can one go wrong with all of that mentioned above, a bottle of local wine, and a panoramic view of the Drakenstein mountains?! When I first met Chef Bertus Basson back in 2014, I found him to be kind, gentle, gracious, and down to earth. Add culinary genius to that, and you get a combination that’s tough to beat. 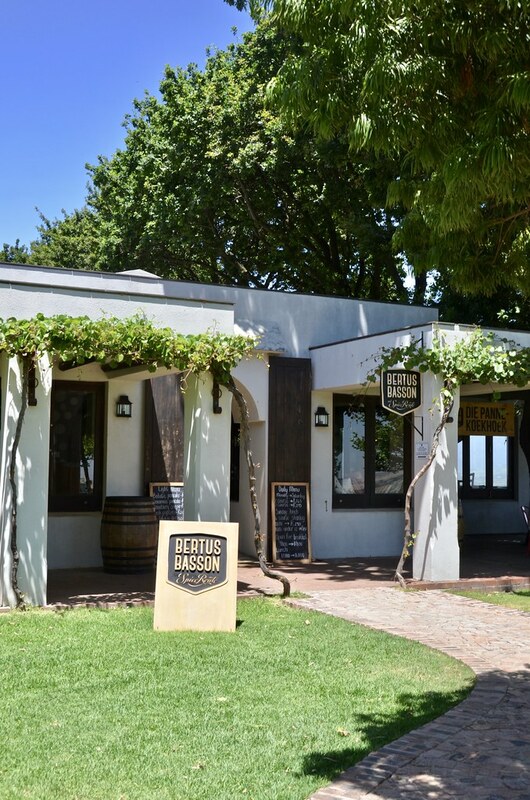 Bertus Basson at Spice Route is part of The Spice Route Community in Paarl where every artisan is handpicked. 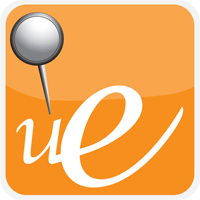 The shared goal is to bring a unique strength and art to the whole collective while supporting each other’s individual trade. 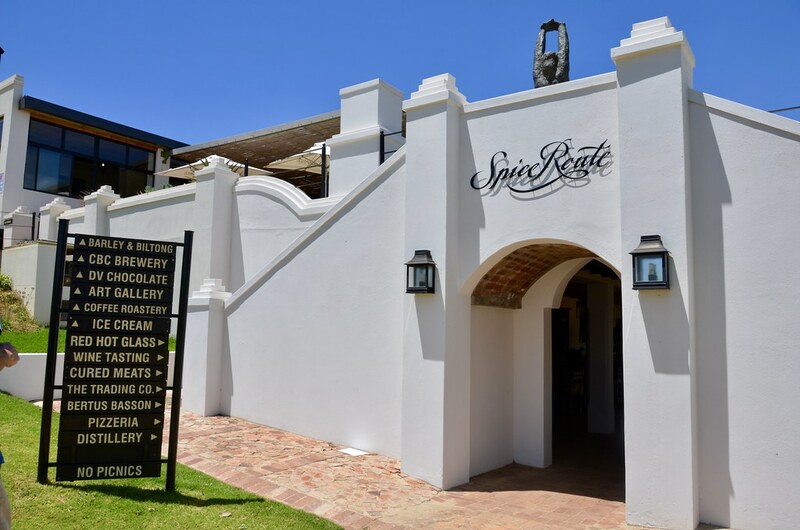 One Response to "Bertus Basson at Spice Route"